Hosta ‘Queen Josephine’ was a surprise gift from one of my sons about two years ago. 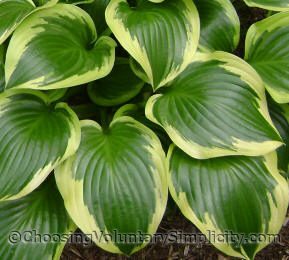 He often searches for hostas I have mentioned, and Queen Josephine was one of the hostas I had been unable to find anywhere locally. 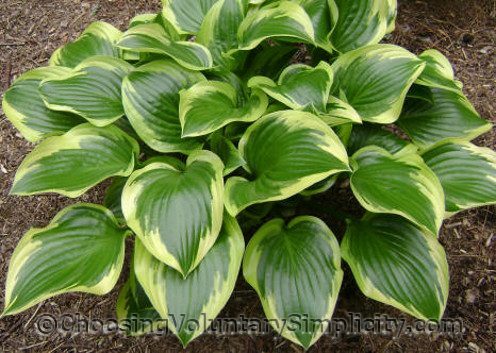 The thick, extremely shiny leaves with dark green centers and creamy yellow margins are this hosta’s most distinguishing characteristic. Queen Josephine has blossomed for me and I was able to harvest a few seeds, but they did not germinate… something I had hoped would happen because seeds from Queen Josephine sometimes produce variegated seedlings. What Did Things Cost in 1872? I really REALLY like this one. So pretty!!!!!!!! I just love the shiny look this hosta has although the one I have isn’t as shiny. Perhaps it is too young yet. Really enjoy this blog. Thanks for sharing all your wonderful knowledge. Mine is located under the backyard deck and receives direct sunlight up to about 1:30 p.m. It actually looks EXACTLY like the picture above and that is crazy! Perhaps QJ is more shiny in sunshine? Just guessing as I haven’t come across and information regarding the shine. This is one of my favorites, but it is an incredible vole magnet. They seem to sense when I’m even just thinking about planting one and are waiting for it.